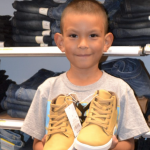 Once a year children in need referred by local school districts receive new clothing, underwear and shoes. This encourages their school attendance and increases their self esteem. 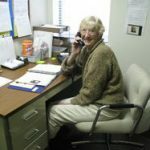 People in need of a reassurance call benefit by a chat with members of Assistance League of Diablo Valley. Calls are made Monday through Friday from 9:00 AM until noon. Community Programs consists of seven programs that supply a variety of services to adults and children who are residents of Contra Costa County who are in crisis or at risk. The Kids on the Block philanthropic program is designed to provide a nonthreatening environment in which children learn about disabilities, safety issues and social problems. 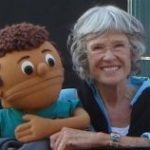 The Puppet Shows include an exchange between students and puppets to clarify, expand ideas or answer questions about the topics covered in the scripts. Members are “listeners” to second grade students at schools in the Mt. Diablo School District. Students practice their reading skills while Assistance League members listen and interact. 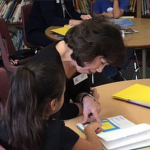 Assistance League members provided 1,650 hours of reading support to second graders practicing their reading skills. is a traveling group of volunteers who visit various assisted living facilities throughout Contra Costa County. 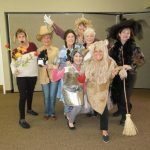 Their goal is to provide fun and enthusiastic entertainment for the residents and to bring a bright spot into their day. They present short, humorous plays with singing and sometimes, a dance step or two. 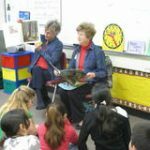 This philanthropic program provides reading enrichment experiences for children in second grade classrooms at twelve elementary schools in Mt. Diablo Unified School District, and to Buena Vista Elementary School in Walnut Creek, CA. Members read to children in the classrooms, and donate books to the classrooms and school libraries. Elementary Arts Discovery is a philanthropic program designed to encourage children’s creative artistic expression. 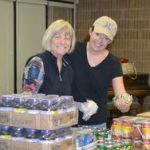 Members volunteer in pairs at Shore Acres Elementary School in the Mount Diablo Unified School District. 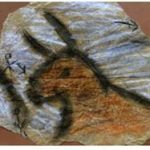 They present art discovery lessons on selected artistic themes and follow these with hands-on art projects based on the theme. 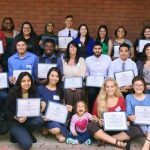 This philanthropic program of Assistance League of Diablo Valley provides students with a variety of financial aid packages for college expenses based upon their need, school and community activities, and grade point average. Applicants must be residents of Contra Costa County, California.